When Motherwell and Celtic take to the field in Saturday's Scottish Cup, one man will dominate the thoughts of both sets of supporters - Phil O'Donnell. O'Donnell remains a hero at Fir Park, where he tragically died on the pitch in 2007 during a match against Dundee United aged just 35. 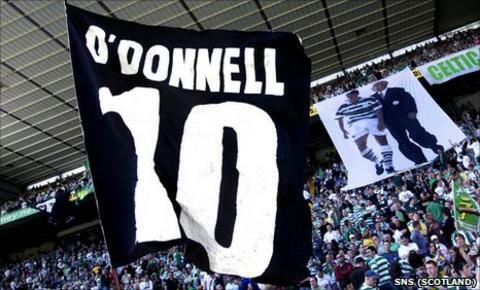 In the aftermath of his death, the Lanarkshire club took the decision to honour O'Donnell by naming a stand at their home ground in his name. The left-sided midfielder scored his first senior goal in the 1991 Cup final as an 18-year-old, helping Motherwell to a famous 4-3 victory over Dundee United. He also featured in the 1995 Cup final for Celtic as they overcame Airdrie 1-0 to win the club's first trophy in six years, ensuring his place in the hearts of the Glasgow club's supporters. Saturday's final is the first time the sides have met in a Scottish Cup final for 60 years, so it seems a fitting occasion to remember the player everyone at Motherwell knew as 'Uncle Phil'. Celtic legend Henrik Larsson spoke after a tribute match for O'Donnell in 2008, and outlined how much the one-time Scotland cap meant to him. "You always have talkers in the dressing room and people who are a little bit more calm," Larsson said of O'Donnell. "He was a little bit more calm but he was a great guy. "I always remember coming to Celtic as a foreigner. There was always someone you could trust if you asked a question. "Phil was not only important for me but for a lot of the foreigners," said the Swede. Tom Boyd played alongside O'Donnell in the 1991 Motherwell cup-winning side and the Celtic team that defeated Airdrie in 1995. He commented after the tribute match: "Both sets of fans appreciated what he did for their clubs, everyone was united to pay tribute to a great football man." Boyd also has fond memories of lifting the Cup with both clubs. Speaking of Motherwell's 1991 triumph, he said: "It was a fantastic game of football. It's what you would like to see as a final, a fitting end to the season. "We certainly did that on that occasion and luckily for us we came out on top. "It's a fantastic achievement for a club like Motherwell to be able to lift a trophy." Having left Fir Park after winning the Cup and spending a short time with Chelsea, Boyd joined his boyhood heroes Celtic in 1992. Speaking to BBC Radio Scotland, Boyd said it was a special moment to capture his first piece of silverware at the famous Glasgow club. "I remember winning the Cup in 1995, the game itself was absolutely horrendous," said Boyd. "We won 1-0 against Airdrie with a goal from Pierre Van Hooijdonk. "I'd been with Celtic for four years and hadn't won a trophy - the club hadn't won a trophy for six years, so it was huge relief and joy in the celebrations. "Tommy Burns was the manager at the time, and you saw the joy on everyone's faces. "Being a supporter of Celtic, it was a very special moment." The former Scotland international insists that both cup wins are highlights of his career, but the one thing the 1991 win holds over the 1995 triumph was the open-top bus tour to greet the Motherwell fans. "For different reasons it [the '95 win] was fantastic but that was something that was missing, the open-top bus going round and seeing all the supporters," said Boyd. "It was something that was very special and unfortunately when you are at Celtic or Rangers you don't get that." You can follow Andy Burke on Twitter. Can Motherwell match class of 91? Read more on Can Motherwell emulate class of '91?